Hi all! I've been trying to do PCA for my RNAseq data to examine the relationship between my samples. I have been asking questions under a different post and Kevin Blighe suggested I start a new post, so here it is. I have RNAseq data from 3 types of tissues, one disease tissue (n=44) and two potential control tissues (n=16 and n=4). I want to do some analysis, and one of which is PCA to get some info on the relationship between the groups and to see if one of the two potential controls is more similar to the disease tissue in gene expression. So, I have raw readcounts for these 64 samples. In this code I used 'batch' because I have also some other samples from other studies, that were therefore not part of the same experiment and I thought that a factor batch (defined in coldata) could help to remove some of the effect of these different experiments. Please tell me if this is wrong. So, there is a very large bar that represents all the genes that are not expressed in the sample, because their normalized logged count becomes a value around 4. So, something is not really right here since my data should be more or less normally distributed now, after the normalization and logging. That said, it might not be clear that I have not removed lowly expressed genes from these datasets. Should I have done this? And if so, what would be a good method and cut-off for this, since I've struggled with this before since it seems so arbitrary, at least to me, a person who is not to knowledgeable in this field. Thank you in advance! I really hope someone can help me with this! PCA usually benefit from first z-scoring, which only make sense if you a normal distribution for the expression data. Typically take a simple cut off at 1 will do, as it is predominately the 0s that you don't want. Gene pattern recommended 1 read per million for the gene over n samples as the threshold. Hannun from WCGNA wrote something about filtering on mean/std. Usually, after a log transforms on the expression level distribution, it becomes bimodal, which is unclear in your case. Can you plot the histograms with more bins? Anyhow, if you are only interested in generating a PCA plot, just take the genes with highest STD for now, and see if the signal is there. Forget about the batch for now. The PCA will show if it is there. Hi btsui, Thanks for you reply! Then I have a few questions: What is and how do I do z-scoring? And a cut-off of 1, that is then based on a single sample I guess? And is this based on raw counts or something else? Of the 63677 original genes, I am then left with 15894 genes. Would you say that the way I do this is correct? I've generated a PCA on the data as is, with the histogram that I've provided before, and I actually think it already looks nice, but now I want it to be solid of course, based on actually normallly distributed data. All three PCA plots look very very similar I would say (there are tiny difference, but the shape is very similar). I guess this makes sense, since PCA looks at the genes with the highest STD anyway, and ignores the genes that are lowly expressed in all samples and the genes that have a low STD? And I'm expecting the groups to be very similar also, so I guess it makes sense that the PCA plot looks like this. Hey, sorry for getting here late. btsui's comments are valid - you should take them on board and explore. How does it look after that? This makes for RNA-seq experiments to be really interesting; however, in any particular experiment, many of these transcripts will not be expressed in the tissue of interest. These 'zero count' transcripts should ideally be filtered out before you even run DESeq2. Now, aside from the fact that I've called them logged counts, I don't see how I'm actually using the normalized counts here to for my histogram...: I create a new table containing the normalized counts (normalized_counts) and then I run the vst function, but I run it on dds, not on the table of normalized counts. And then I make a histograms based on the result from the vst function, that, as far as I'm aware doesn't contain the normalized counts. Here I obviously get the same error, since I'm basically only changing the name of the thing. I'm sure I'm misunderstanding something somewhere, so I hope you will be able to help me clear it up :) Thanks!! ...here, you actually overwrite your DESeq object, dds, with the first line, and then try to run vst on what is then a simple count matrix with no relation to DESeq. You just need to run vsd <- vst(dds, blind=TRUE) without the first line. The DESeq2 vignette goes over this, Extracting transformed values . 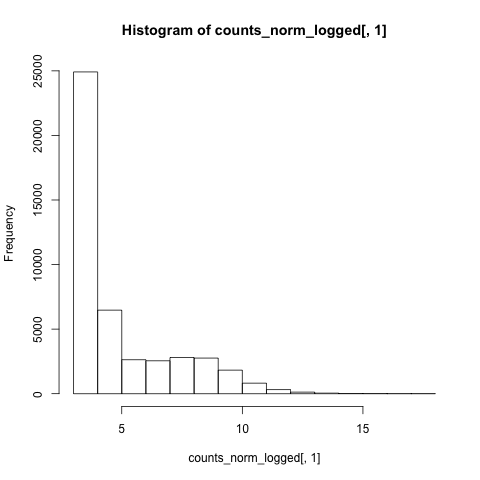 The only major issue that I had with your first histograms is that you were only plotting for a single sample with hist(counts_norm_logged[,1]). The new plots (including the PCA bi-plot) that you've posted above look fine. Try also a simple boxplot(), and generally, the other things mentioned here: Data quality assessment by sample clustering and visualization. Then, what you say about the new histograms above, in response to btsui. The first few histograms, without the filtering of genes, I guess they don't look good, right? I mean, the massive peak for unexpressed genes I guess is making the distribution not normal. So, do I have to filter them out until this peak is completely gone, or is there some intermediate (I don't want to filter out genes that might be relevant because they are somewhat expressed in some of the samples)? I also would love to do some Pearson correlation on these data. For that I also have to use the normalized counts, right? The same data as I used for the histograms? And I would also then need the same kind of filtering for not/lowly expressed genes, right? Are there some additional tips you could give me for the Pearson correlation? Because so far I've noticed that if I run the Pearson correlation on differently (wrongly) normalized and logged data, even tissues that are not supposed to be anything alike (for instance brain and liver) have a high correlation coefficient, so I'm wondering if I'm actually doing it right... Or should I filter on high STD genes for this or something? How do I extract the right data from the DESeqDataSet to use for Pearson correlation? Is it one of the below options or something different? If I used counts_norm, then basically all Pearson correlation coefficients (also between tissues like brain and liver) are basically between 0.9 and 1. It automatically also normalizes the data? Of course, the authors know what they're doing, all of the defaults are appropriate for the overwhelming majority of use-cases. 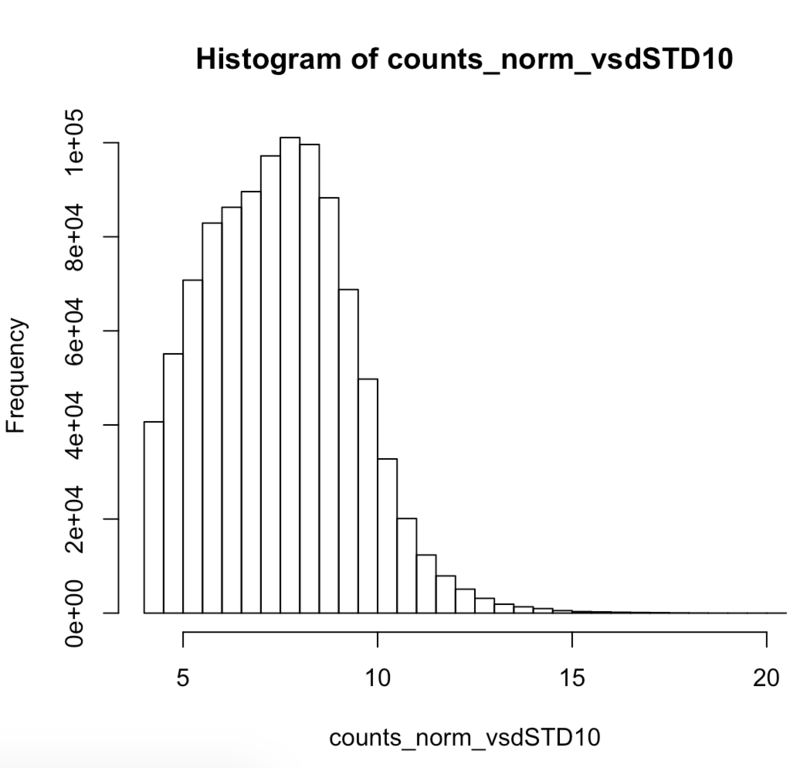 Regarding counts(dds, normalized=TRUE), it's for getting normalized counts. Sometimes that's nice for plotting or people like to look at them to get a feel for the data. The histograms you posted look fine. You are vastly over thinking and worrying about this. I also would love to do some Pearson correlation on these data. For that I also have to use the normalized counts, right? This is covered with a very nice heatmap example in the DESeq2 vignette. Read the vignette and reproduce what's in it. I'll try the code in the vignette.